Is there a place more perfectly suited to holiday celebrations than London? As the setting for A Christmas Carol, lights look even more beautiful on the historic buildings and goodies like mince pies and pudding can be found in abundance. 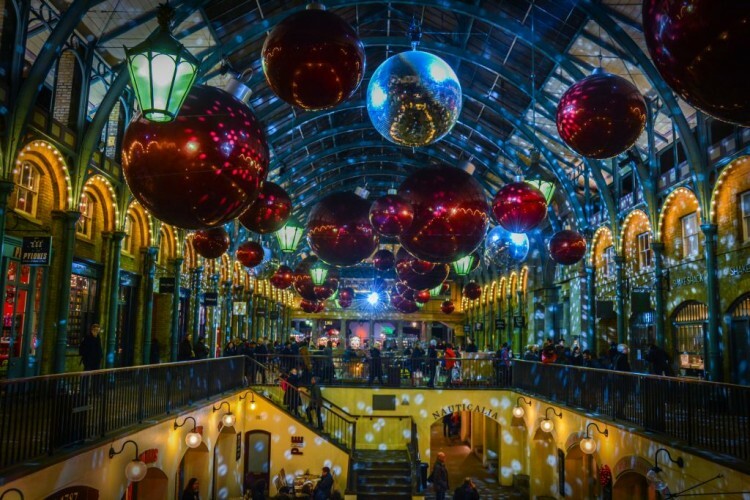 If you have the opportunity to visit London next Christmas season, here are 15 must-see activities to add to your list. Visit Hyde Park’s Winter Wonderland to skate on a magical ice rink, ride a sparkling Ferris wheel and walk through an ice castle. See the most gorgeous Christmas lights in the city at Oxford Street, Regent Street and Covent Garden. Get your fill of British sweet treats at the Real Food Christmas Market. Take a picture next to the huge Christmas tree in Trafalgar Square. Tell Santa what you want for Christmas and see wild animal habitats decorated for the holidays at ZSL London Zoo. Watch a performance of The Nutcracker by one of the best ballet companies in the world, the English National Ballet. Participate in The Great Christmas Pudding Race and attempt to balance a Christmas pudding on a plate while you run and avoid obstacles. Attend a Christmas service or watch carolers perform at Westminster Abbey. Take part in a Norwegian approach to Christmas at Nordic Yulefest, complete with an indoor birch forest, games and Norwegian treats. Meet Santa, along with his reindeer and sled dogs, at the WWT London Wetland Centre. Go ice-skating, make your way through a Christmas tree maze and grab snacks at the Christmas Street Food Market at Vauxhall. See a giant parade of Santa Claus’s during the Santacon London event. Find beautiful handcrafted gifts at a holiday-themed Crafty Fox Market. Celebrate a 19th-century Christmas Eve at the Charles Dickens Museum. Roast marshmallows over a bonfire amid pine trees and enjoy a spiked holiday beverage at the Queen of Hoxton rooftop bar. And if you still need your British holiday fix, enjoy the fanciest of all Christmas events at The Ritz.